You are here: Home › G2 Handguards › The Strongest Moto Handguard Mount Ever? The Strongest Moto Handguard Mount Ever? G2 Ergonomics released it’s latest product this week. The MONGO Handguard Inner Mount system. The G2 Mongo Handguard Clamp is another great solution for off-road riders. The standard handguard has a clamp that attaches to the handlebar between the crossbar and triple clamp handlebar clamp on 7/8” handlebars, or on the tapered section of Taper style handlebars. This system is barely adequate in strength and has very limited adjustability. The Mongo Handguard Mount smokes the competition in strength. 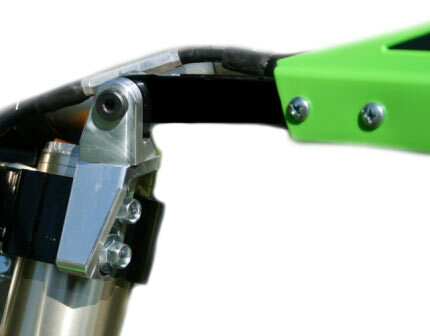 By attaching the mount to the two fork pinch bolts on the top triple clamp, you now have a fixed inner position that prevents the handguard from rotating up or down in crash situations. The mount is machined from 6061 aluminum of two pieces (each side) held together by precision machined shoulder bolts. Another huge benefit of the Mongo Handguard Clamp is it’s adjustability. Each side consists of two pieces. These pieces can be assembled in 12 possible combinations to properly mount your handguards to almost any bend/length/rise/sweep of handlebar. In addition, the top piece of the clamp swivels to match any handguard angle, and the slotted bottom section allows approx. 1/2” of up or down positioning! The third major benefit of the Mongo handguard Mount is the “clevis” style attachment feature. The handguard is not simply bolted to the Mongo in a fixed position. Rather, it is cradled securely in the Mongo clevis with a precision machined shoulder bolts. This allows the handlebar to flex as it was designed, which transmits less shock and vibration to your hands!